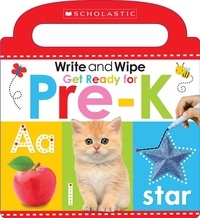 Write and Wipe Get Ready for Pre-K is perfect for preparing children with the essential learning topics for Pre-K success. The book comes with a wipe-clean pen and the chunky, glossy board is easy to clean, so that children can try a page, wipe it clean, and try it again! This interactive book shows children exactly how to write numbers, trace shapes, and learn their letters. It also provides plenty of practice in pen control so that children will become confident writers!